Chartering a private jet doesn't get any better than with our team. A lot of charter companies claim that they offer incomparable service. SKY Partners actually delivers it. Their customers experience the difference, and that's why they keep coming back. We fondly call it the "AA Experience". We are obsessed with every detail of the trip, and work hard to understand the client needs. You never have to tell us what you want or need twice. SKY Partners' specialty is knowing you and remembering you, your family, or your colleagues. Remembering your dog's name and his favorite doggie biscuit. This is no time for false modesty. Simply said, the competition cannot compete with the combination of AO Sky and SKY Partners working together. Remembering your dietary restrictions, or your favorite wine, or the appetizer you liked most on the way to Maui, or that special boarding music that made you feel so relaxed just before takeoff. Along with SKY Partners' incredible ability to remember, they also ensure your flight is safe from the moment the aircraft starts its engines to the final moment N819AP pulls up on the FO ramp at your destination. 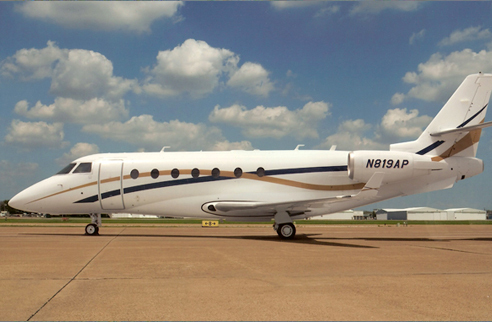 The SKY Partners Charter Concierge ensures your ground transportation is there. SKY Partners was the first in our industry to deploy a "triple check" system of your ground transportation reservation on the day of your trip. At SKY Partners and AO Sky, we keep our promises, so you can keep yours. The strength of N819AP, is the crew. They are the finest in the industry. But, they are human too. Other charter companies out there say the never make mistakes. But, quite frankly, we just know that's not true - even in a company as fanatical about service delivery as SKY Partners. But on the rare occasion when, for example, someone missed that special hors d'oeuvres you were hoping for during your flight, or perhaps your ground transportation isn't quite right, the entire SKY Partners team is ready to become your problem solver. We are the first to admit when we've provided you with less than-perfect service. And we are the first to make it right. We are proud of our honesty and are at our very best when we become problem solvers. To learn more about what makes us different – see Commitment to Excellence below.